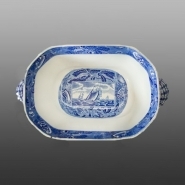 Interior view of the soup tureen printed in the Fleet Scene II pattern. A view of the top of the cover printed with the border pattern. 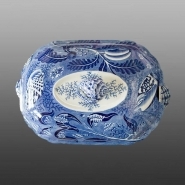 An earthenware covered soup tureen with molded scallop-shaped handles and cone-shaped shell finial. Printed in blue with a pattern named Sailing Galley. For more examples in the Shipping Series click here.